Take your riding to the next level. Get faster times on your bike course at the Triathlon Series, and transition to your run with more energy. We will focus on the 5-mile course. Experience course recon, technical drills and transition practice. Bring your questions! Mountain Bikes ONLY please (no hybrids). Clipless pedals recommended. Helmet is mandatory. Instructor Jimena Dolzadelli is a two time Olympian, and four time NORBA Champion. Registration is required by May 23rd. Join us for lunch, an update on Winding Trails, and an interesting presentation given by Lisa Johnson, Director Emeritus of the Stanley-Whitman House, on Farmington's ancient Memento Mori burial ground which is one of Connecticut's oldest English cemeteries. First established in the 1650's, the cemetery is an historic and artistic treasure that tells us much about early Puritan attitudes toward religion and life. The site is owned by the Farmington Village Green and Library Association and maintained by Stanley-Whitman House. This talk will focus on the history and evolution of the cemetery, with a few stories about the characters who now "reside"
there. Registration is required by April 29th. Your child will spend 1.5 hours a week participating in a variety of outdoor adventure activities from learning the basics of rock climbing on our 40' climbing tower, consisting of 4 sides; a 15' beginner wall, a 35' intermediate wall, a 35' advanced wall and the fourth side is a 60' x 35' cargo net. Participants may also have the opportunity to spend some time on our high ropes course where they would walk across cable bridges, climb up ropes, climb through tires, maneuver around logs, climb up, in and over a canoe, negotiate a giant's ladder, swing from 50 feet, and jump into the abyss. Through this, your child has the opportunity to overcome personal fears and develop new self-confidence and trust. Registration is required by 3 days prior to the start of each session. Please note- Session One is for K - 2nd grade, Session Two is for 3rd - 5th grade. Junior Lifeguarding is a newly revised program which is designed to guide youth to the American Red Cross Lifeguarding course. This course focuses on building a foundation of knowledge, attitudes, and skills for future lifeguards. Please note that this program does NOT provide any type of certification. Registration is required 3 days prior to the start of the session. Would you like to become a certified lifeguard? Participants who successfully complete the course will be certified in CPR, First Aid, Lifeguard Training and Waterfront Training. All candidates must be 15 years or older by the end of the last class. Prerequisite: 1st day is able to swim 550 yards continuously using only front crawl with rhythmic breathing and breaststroke; tread water for 2 minutes using legs only; swim 20 yards pick up brick and swim back with brick within 1 minutes and 49 seconds; and swim 5 yards submerged and retrieve three rings (5 yards apart). Registration is required one week before the start of class. This educational and entertaining program will take you around the world with a unique group of rescued and adopted animals, representing diverse habitats. While exploring these habitats, we will discover some of the musical instruments used by people indigenous to these regions, such as a rain stick, maracas or a drum. We'll also discuss examples of animals that contribute to nature's symphony including song birds, chirping crickets and chorus frogs. You will meet incredible live Animal Ambassadors! This is a free program provided by donations made to the Trails Fund. Registration is required by August 7th. Bullseye! But can you do that twice? You can after learning the techniques and skills of a great marksman. Come try this challenging and exciting sport. Candidates must be at least seven years of age. All classes will meet at the Archery Range near Walton Pond. Registration is required by 3 days prior to the start of each session. This is a members only class. Come join us for a fun filled creative class that will stir your preschooler's imaginations. Every week your child will enjoy an hour of creative arts and crafts projects that they will be able to take home and show off to the entire family. Registration is required by April 14th. Winding Trails will once again be presenting the popular Baked Potato Fest. Bring the family and create your own luscious version of these meal-sized baked potatoes and join in the fun of dancing to the Electric Slide, Chicken Dance and other fun dances. Give yourself a night out and join us for an evening at Walton Pond! Registration is required by July 8th. This is a members only event. Menu: Garden salad, baked potato (with assorted toppings), dessert, beverages. Baseball takes the rich history of the game from Cooperstown to your town. Our staff uses our progressionnal curriculum to teach the fundamentals of fielding, catching, throwing, hitting, and base running, all in a fun, positive environment. Specifically designed for beginner and intermediate players, this camp teaches all athletes new baseball skills along with vital life lessons such as respect, teamwork, and responsibility. Participants come away with new friends, new skills, and a love for the game! Participant-to-coach ratio: 12:1. This fun, skill-intensive program is designed with the beginning to intermediate player in mind. Using our progression curriculum, our basketball staff focus on the whole player, teaching your child the skills needed both on and off the court to be a better athlete. Each day will start with a "skill of the day" and progress into drills and games. After a week of passing, shooting, dribbling, and rebounding, your child will show you why this is one of our most popular programs. Fishing is a physically and emotionally healthy activity- but can also provide healthy food for your brain and body! Fish are high in protein and Omega 3 fatty acids and low in cholesterol and fat. Everyday more and more people are choosing to eat more sustainable foods- either through gardening, shopping at local markets, or fishing and hunting for protein. The DEEP fisheries division is offering this course to adults who have some previous fishing experience but would like to learn more about keeping fish you catch for food! We will cover what local fish in CT are best for eating, regulations on keeping fish, provide tips on targeting these fish, how to clean your catch, popular cooking methods and recipes, and more! Must have prior fishing experience or have taken the Introduction to Fishing class. Class 9:00am-10:30am, Fishing 10:30am-11:30am, Preparing the catch, 11:30am to 1:00pm. Please register by Monday, June 24th. Some of Connecticut's top-rated bass waters are a short drive from anywhere in the state. Whether you're looking to fish largemouth, smallmouth, or both, bass offer a challenge for those that have been fishing and want to expand their skills. The CT DEEP Fisheries Division in cooperation with the CT BASS Nation is offering a FREE Introduction to Bass Fishing class to help make your fishing season a success! Certified Fishing Instructors with decades of bass fishing experience will share their secrets. We will cover all the basics of bass fishing: species identification, where to catch them, how to catch them in every season, proper equipment, baits and lures, and much more! After the indoor class, you can try out your newly learned skills at Walton Pond and Dunning Lake. If you have been interested in bass but didn't know where to start, this class is for you. Participants should have some basic fishing knowledge and experience. Participants are asked to bring their favorite rod and reel. Minimum age is 9-years-old. Indoor class 9:00am-11:00am, Outside demonstration 11:00am-11:30am, Lunch (bring your own) 11:30am-12:00pm, Practice 12:00pm-2:00pm. Please register by Tuesday, May 14th. Have you or someone you know always wanted to learn how to fish? The CT DEEP Fisheries Division is offering a FREE Introduction to Fishing class to help you have fun as you learn this great life skill. This introductory class is designed for adults and families with children ages 8 and up. Certified Fishing Instructors with decades of fishing experience will share their skills. We will cover all the basics of fishing: how to setup a fishing rod, basic fishing tackle, proper bait selection, how to identify your catch, and much more! After the indoor class, you can try your newly learned skills at Walton Pond. Join us to catch that first fish and start a lifetime of fishing with family and friends. Indoor class is from 9:30am to 11:30am, lunch (bring your own) is from 11:30am to 12:00pm, Practice is from 12:00pm to 3:00pm. Please register by Monday, May 13th. This two and a half hour program allows you to get onto the climbing tower and enjoy the vertical realm! The climbing tower is 40 feet high consisting of four sides: a 15 foot beginner wall with incline, a 40 foot intermediate vertical wall, a 40 foot advanced wall with incline and over hangs, and a 60 foot by 45 foot cargo net for the quickest way to the top. Then it is off the tower via a 300 foot long zip line. Registration is required by three days prior to the session date. Have fun under the Boathouse Pavilion looking out at our beautiful lake and natural surroundings ... painting, doodling, drawing, printing and more. It's never too late to be the artist you always wanted to be. Emphasis is on helping you "loosen up" and enjoy combining outdoor time with creative art making. A perfect series for all levels. Sessions scheduled for July or August. Each session will be unique so that you can take more than one session. Each Session includes 3 classes. Your camper will participate in a variety of outdoor adventure activities from learning the basics of rock climbing on our 40' climbing tower, to soaring through the air on our High Ropes Course, to splashing around in the lake through lake orienteering and raft building, as well a Discover SCUBA program. Your camper is sure to leave with lasting memories as well as the opportunity to overcome personal fears and develop new self-confidence and trust. Friday we will go to Brownstone Exploration & Discovery Park in Portland, CT. This trip will be a full day and will run until 4:30pm. Have you ever wondered what it is like to breathe underwater? Or maybe you have just heard so much about the Walton Pond project and you wanted to take a closer look at the progress. Well then come out and see what everyone is talking about. In this program we will spend a little time to explain the basic principles of scuba diving and give you an overview of your scuba gear which will be supplied for you. Once you feel comfortable, we will help you learn basic scuba skills. The skills you learn during your Discover Scuba Diving experience may be credited toward the full Scuba certification course. Gear will be provided. Registration is required by August 12th. Join us at Tunxis Plantation Country Club for a great day of golf, games, food and fun to raise money for our Campership Fund. Play as a foursome or as a single and complete someone else's team. The entry fee includes 18 holes of golf (best ball), a cart, lunch, dinner, games and more. Registration begins at 11:30am followed by a shotgun start at 12:30pm. All proceeds will go to our Campership Fund. Help us make happy campers! Get outside on Saturday nights with Miss Judy for an educational walk with hands-on activities with your family and friends. After the walk, return to make a fire, roast a few marshmallows, and enjoy some lively conversation. On those nights when it becomes fully dark, we walk to the recreation fields to view the night sky for seasonal constellation identification and to view special celestial events. Come prepared for the weather by wearing a pair of good hiking shoes and clothes that can get a bit dirty. Registration required three days prior to the session. Session 1: Water All Around, Session 2: Lichens, Session 3: Insects, Session 4: Spiders, Session 5: Mushrooms and more! bacon, sausage, cereal, juice and other assorted breakfast goodies. After you have enjoyed your wonderful breakfast, your entire family will be delighted as they scramble for all the holiday goodies scattered about in the egg hunt! We have plenty of treasures and treats for all. In addition to the candy and toys, every family will receive one golden egg with a special prize inside! Don't forget your goodie bag/basket to hold all your findings. Members only. Registrater early, this program will fill fast! Bring your family for a game night at Winding Trails! Join us at the Boathouse Pavilion for food, trivia, board games, a scavenger hunt, and much more. Pizza, snacks, dessert, and beverages will be included. Don't miss out on the fun! Registration is required by August 5th. This is a members only event. The Farmington River is consider one of CT's most scenic waterways. Join the Winding Trails staff on the "flats" of the Farmington! This a trip for all skill levels. If you have never canoed, we will teach the basics. Winding Trails will provide gear and transportation. Registration is required by June 6th. Flag Football is the perfect introduction to "America's Game" or a great refresher for those who want to brush up on their skills preparing for league play. Through our "skill of the day" exercises, campers will learn skills on both sides of the ball including the core components of passing, catching, and deflagging or defensive positioning- all presented in a fun and positive environment. The week ends with the Sports Bowl, giving participants a chance to showcase their skills on the gridiron! This program breaks down the fundamental skills of golf through easily understood and applicable games and exercises that increase the athlete's abilities. Each athlete will learn proper grips, footwork, and swing mechanics to help develop the total player. Each day will start with a "skill of the day" and progress into drills and games. This class will provide instruction in the basics of our watercrafts including canoes & kayaks. Students will also learn some basic water safety skills. Skills and exercises will be presented with the emphasis on FUN! Registration is required at least three days prior to the start of each session. Come along on this adventure as we enjoy the weather out on our lake. In the beginning of the week we will be canoeing, the second half of the week we will be kayaking. This camp will cover paddle strokes, rescue techniques, and whitewater basics. On Tuesday we will canoe and Friday we will kayak down the Farmington River. Both of these trips will be full days and will run until 4:30pm. This is the ultimate night out for any kid! Tons of games, pizza, an ice cream sundae bar, a big screen movie, and endless amounts of fun await you here at the Trails. This program has evolved into a very popular kid's event and space fills up quickly. So parents plan your night out and send the kids here for theirs. Head on over to the Trails for a night out that you will never forget. Sorry, parents not allowed! Please bring clothing that is appropriate for outdoor (weather dependent) and indoor play as well as provide a sleeping bag/blanket and pillow for the movie. Registration is required by May 14th. Calling all kids ready to have some FUN on the bike! Come and ride the trails and learn a few tips about technique, balance and eye focus. We will work on body position uphill & downhill, shifting, breaking and turning. Mountain bikes only, helmet mandatory. Instructor Jimena Dolzadelli is a two time Olympian, and four time NORBA Champion. Registration is required by May 22nd. Suit up and find out why lacrosse is one of the fastest-growing sports in the country. Lacrosse combines the basic skills used in soccer, basketball and hockey into one fast-paced, high-scoring game. Athletes will learn all the fundamentals of stick handling, cradling, passing, and shooting in a fun, non-checking environment. Our staff helps campers learn not only the sport of lacrosse, but also important life skills such as respect, teamwork, and discipline. Designed for ages 7 to 12, this camp ensures that every athlete will come away with a deep understanding of the game and its traditions. Wrona Soccer is proud to be working with Winding Trails to be able to offer opportunities for players of all ages with our camp this summer. Our experienced staff excels at knowing how to get the best out of players through demonstrating techniques and inspiring players to reach higher. Our players learn the fundamentals of the game, ball control, passing, defending, and scoring. We will teach every child at their own pace. Join the fun! Each day your camper will spend time learning and practicing their skills on the Outdoor Bouldering Wall, the Climbing Tower and participating in adventure activities. Skills such as balance and coordination will be presented with the emphasis on FUN! This club is ideal for all running abilities. From novice to well-seasoned trail runners. This program will teach you how to build up your stamina on the trails and eventually run longer and more comfortably. Running trails are easier on the joints and works all muscle groups all while building up your cardio fitness. For the beginner, you will learn how to navigate the trails and have fun. This club is about having fun, enjoying nature, meeting new trail runners, building friendships, and finding a new kind of running. Each week you will learn a new skill on how to better your running. All abilities welcomed, no special equipment required. Instructor: Keith Meyer. Registration is required three days prior to the start of the session. This program is designed for children ages 3-6 years old. Basketball, soccer, tee-ball and tennis will all be included in this 5 day, 1 1/2 hour program. The program will focus on teaching the very basic beginner skills of each sport and will have a big emphasis on having fun. The Farmington River Watershed Association (FRWA) and Winding Trails are teaming up for this timely workshop. Aimee Petras, the Education & Outreach Coordinator at the FRWA, will present this program that covers how to manage your lawn without using chemical fertilizers and pesticides. We will outline the steps you need to take including getting a soil test through mowing techniques to manage weeds. Additionally, we'll delve into common lawn problems such as grubs and thatch. Registration is required by April 24th. Join Miss Judy for an afternoon family nature walk. This walk is geared toward families with children that enjoy exploring all around the property. Each month, the walk will take your family to a different location for discovering a new topic. Based on the topic, we'll look for animals, catch a few, check out a hidden spot in the forest, observe how things grow, and much more. So we can explore rain or shine, wear good walking shoes and outdoor clothes that are appropriate for the weather and can get dirty or wet. Registration is required three days prior to the start of the session. Session 1: Lichens, Session 2: Insects, Session 3: Spider Webs, Session 4: Mushrooms of the forest. Discover the wonder of observing nature in real time. Explore different waterways as we locate frogs, turtles, and other aquatic animals. Wandering the forest and field checking on the squirrels, birds, and other land animals. Learn some life skills such as fishing and fire building. Relax with kayaking and swimming. Each day involves hands-on activities and experiments. During our walks, we will explore, collect, and observe animals and different environments. Dress for the weather, bring your imagination, and plan to have fun as we discover what's out there! Nature's Open House is a walking tour of 80+ fairy and gnome dwellings set along a three-quarter mile stroll through our wooded trails. After being inspired by the tour, you are ready to build your own fairy house in the permanent Winding Trails Fairy House Village. Using only natural material, you are free to create a place that is interesting, fun, cozy, inviting, and uniquely yours. Tickets are $5.00 per person. Please note: Tickets purchased the day of the event will cost $8. Who's ready to go camping? You bring the tent, sleeping bags and toiletries and we will do the rest! This program provides you and your family the opportunity to spend more quality time together and make memories your kids will cherish forever while enjoying dozens of activities and camping out at Winding Trails. Activities available will include soccer, basketball, baseball, boating, archery, and a special night hike ending with a campfire and s'mores. A BBQ on Friday night (6:30pm - 7:30pm) and a continental breakfast on Saturday morning (7:00am - 8:30am) are included. Please note: the availability of archery and boating are based on certified staff availability and cannot be guaranteed. This is a very popular program so early registration is advised. Registration is required by three days prior to the session date. Members Only Event. Scale new heights and explore the subterranean wonders. Learn and practice technical skills and movement on our 40-foot outdoor climbing tower. We will cover the description and use of basic hardware, belaying and rappelling, as well as discuss the formation of caves, structures and wildlife. On Tuesday we will be caving in New York and Friday we will go to Rattlesnake Mountain here in Farmington. Both of these trips will be full days and will run until 4:30pm. 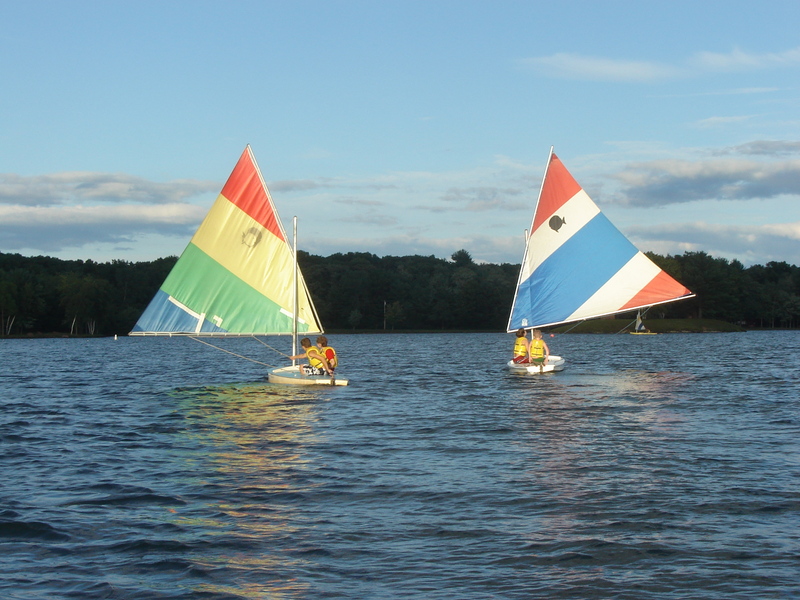 Sailing classes will be offered on beautiful Dunning Lake. Learn the parts of a sunfish along with set up procedures, basic maneuvering, tacks, jibes, capsizing and safe boating practices. All sailing is two or three people per sunfish. Registration is required at least three days prior to the start of each session. Brian Bradley, an experienced falconer and animal trainer for over twenty years, is invited back to present his Sky Hunters in Flight program. His passion for the outdoors and birds of prey led to his apprenticeship with the famous falconer and biology professor Heinz Meng. The presentation is a detailed look into the world of owls, hawks and falcons. Discover their place in the environment and how these raptors hunt. This informative, action-oriented program will offer something for everyone. This is a free program provided by donations made to the Trails Fund. Registration is required by June 24th. Shoot and score with our new soccer camp. Participants will learn the fundamentals of soccer including game rules, dribbling and shooting techniques, as well as the proper positions on the field. The program will be a mix of drills and fun games with the intent of getting ready for a full field game on the last day of camp. The main emphasis will be on having fun while playing the world's game! A soccer program for boys and girls will provide very basic instruction in the fundamentals of the game of soccer. Skills and exercise will be presented with the emphasis on FUN! Registration is required by 3 days prior to the start of each session. This is a great opportunity to get together with friends by taking part in a fun race with them. Kids may want to graduate to the full triathlon in August, held in Mansfield. (All finishers are entitled to reduced registration before July 4) Swim caps, finisher medals, and refreshments for all participants. Pre-Registration and Day of Registration are both available for this event. Register before June 7th to be guaranteed a t-shirt! Start the summer off sizzling. Enjoy the sounds of summer provided by our DJ and dance away the night in the evening breeze on Walton Pond beach! Join in on our family summer game tournaments, including bean bag toss, ladder ball, beach volley ball and many more. The kids will also enjoy our inflatable obstacle course and bounce house. Offerings will also include a cookout and activities to delight the young and the young-at-heart. Registration is required by June 24th. This is a members only event. Menu: Hot dogs, hamburgers, mixed vegetables, potato salad, fruit salad, dessert, beverages. Looking for a fun way to improve your stokes, or would you like to learn more about being on a swim team? Join the Winding Trails Swim Team. We are currently not participating in local meets until we are able to grow the team. Join us for daily practices to improve your skills! Register by June 21st. Prerequisite: Must be able to swim 25 yards unassisted. Sports Tennis breaks down the fundamental skills of tennis through easily understood and applicable games and exercises that increase the athlete's abilities. Each athlete will learn proper grips, footwork, strokes, volleys, and serves to help develop the total player. Participant-to-coach ratio: 8:1. This program is designed for children 3-4 years old. The one hour program will focus on teaching the very basic beginner skills of sports, balance, coordination, and ball handling with a big emphasis on having fun. Do you love our weekly Tri Series? Why not continue Tuesday evenings at Winding Trails with out new Trail Running Series! For 5 weeks on Tuesday nights, there will be a short course (5k) and a long course (10k) race. Awards will be given out at the final race. The top three overall in each age group (male and female on each course) will be recognized. Receive a t-shirt when you purchase a series pass! Online registration is for season passes ONLY. One day registration will only be available on site before the race begins. Season passes can also be purchased on race day. Registration opens at 5pm on race day. Are you a new member and not quite sure where everything is? Then this extensive tour of the park is just for you. Learn about the history of Winding Trails, where all the facilities are, and where the "special" spots can be found. Dress appropriately for weather and walking. Registration is required by Thursday, May 2nd. Your camper will spend 2.5 hours a day participating in a variety of outdoor adventure activities from learning the basics of rock climbing on our 40' climbing tower (consists of a 15' beginner wall, a 35' intermediate wall, a 35' advanced wall, a 60' x 35' cargo net and a zipline). Your camper is sure to leave with lasting memories as well as the opportunity to overcome personal fears and develop new self-confidence and trust.